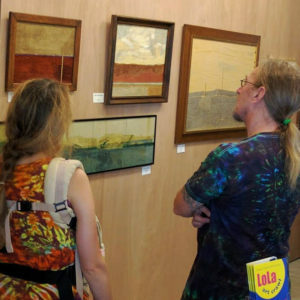 Building on last year’s successful two-day event, and because of the generous support of our Sponsors, we are happy to announce our friends at Squirrel Haus Arts and The League of Longfellow Artists will host a four-day event this year. 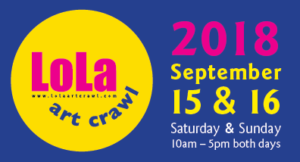 Almost 50 LoLa Artists will show about 100 pieces of their work. Be sure to visit the 2019 LoLa FAE Facebook page for views into the diverse mediums and wide-ranging styles. Come to see the art, stay to make a fun little item to take home during drop-in artist activities for all ages, at the second LoLa Winter Fine Art Exhibition at Squirrel Haus Arts, 3450 Snelling Ave. S., Longfellow, Minneapolis. Admission is free and open to the public; a small donation is optional for make-and-take activities. More opportunities to visit, and more reasons to drop in and see what’s happening. Open for two weekends instead of one, with the opening reception at the close of the first day. For art lovers with small budgets: Some of the artists will also have small items for sale during their volunteer gallery shift, such as note cards featuring their artwork. This will be continuously changing. Artist educators will lead informal make-and-take activities for children and adults (very small children will need an adult helper), for a small optional donation of up to $5 to cover the cost of materials. These will occur at various times during gallery hours. Saturday, Feb. 16, noon–2: Make a cardboard mask with Pete Talbot, and play a cardboard pinball machine. Saturday, Feb. 16, 2–4: Make your own zine from a single sheet of paper with Olli Johnson. Sunday, Feb. 17, noon–2: Make a mini alphabet book to write and sketch in, with Meg Erke. Saturday, Feb. 23, 2-5: Since Andrea From’s art is whimsical and kid friendly, make and take tissue paper collages in the style of Eric Carle. Sunday, Feb. 24, 2–4: Make a mini polymer clay pig (for Year of the Pig!) with Laura Burlis. Stay tuned to this site’s News page, as well as our accompanying Facebook page for more information. 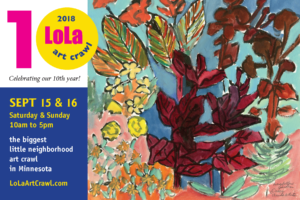 A LoLa Artist is someone that has participated in a LoLa Art Crawl OR lives or works in the greater Longfellow neighborhood. Artists are encouraged to attend the reception, and are welcome at the gallery hours, but this is not required. For questions about anything else LoLa related, contact LongfellowArtists@gmail.com. The Crawl continues rain or shine with plenty of options for dining, shopping & more. A community-founded farmers market celebrating 15 years. We are proud to partner with aspiring and established artists and invite them to show off what they do best. Classic American fare including burgers & beer with patio & drink specials.